The Ted Constant Convocation Center is a 9,100-seat multi-purpose arena located on the campus of Old Dominion University. Operated by Global Spectrum since it opened in 2002, the Constant Center is known as one of the premier mid-sized collegiate venues in the country. The Constant Center is the cornerstone of the University Village project, a 75-acre development that also features restaurants, shopping, offices, research labs and residences with high-tech connections to the campus. 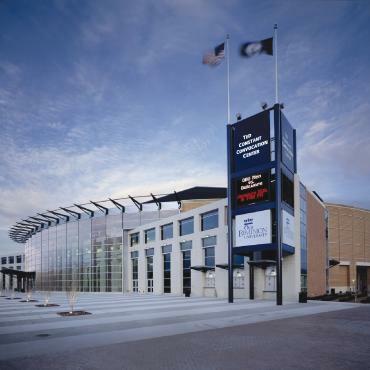 The Ted Constant Convocation Center is home to the Old Dominion Monarch Men's and Women's basketball, and plays host to ODU Wrestling matches, a variety of family-oriented events as well as concerts, ODU commencement, career fairs, and lectures. "The Ted" has 7,319 (fixed) fully cushioned seats, 862 upper club/priority seats, 16 luxury suites, and a state-of-the-art scoreboard. The arena currently seats 8,639 for basketball games. The Constant Center has recently been equipped with more than 50 high-definition flat screen televisions, premiere interactive suite controls, state-of-the-art sound and lighting, impressive meeting room technology, and substantial back of house amenities.